As you can see, it is no wonder we are plagued with bad comedies all time because in terms of total grosses, this genre tops the others with its amazing 1.7 billion Dollars easily. The next two genres are the usual suspects: Comic Book and 3D Animation. Both earned almost the same amount of money. Comic Book reached $983 Million hence being only $6 Million higher than 3D Animation. The next Genres can be described as the middle group, ranging from Drama ($614 Million) to Fantasy ($520 Million). Of course, INDIANA JONES was the biggest movie in the Genre of Period Adventures. Without it the genre would have reached $242 Million, and not $560 Million. Perhaps some Horror fans scream in anguish, yet SAW V was the highest grossing Horror Movie, the Genre in total earned $247 Million, which results in a 10th place. And as a total surprise (at least to me), the success of MAMMA MIA and HIGH SCHOOL MUSICAL 3 helped the Musical Genre to its pseudo-revival and an adequate 11th place. The same goes for romance. Its overall success is the result of the massive success of TWILIGHT, which was the most difficult movie to add to a specific genre. While for Adventure fans of all kinds 2008 was a good year, the pure Adventure Genre (not Period Adventure) garnered only 214 Million Dollar with JORUNEY TO THE CENTER OF THE EARTH ($101 Million) at its top. Romantic Comedies and Action Horror (interesting genre) had no good year with three and two releases respectively hence only earning a rather small amount of money. 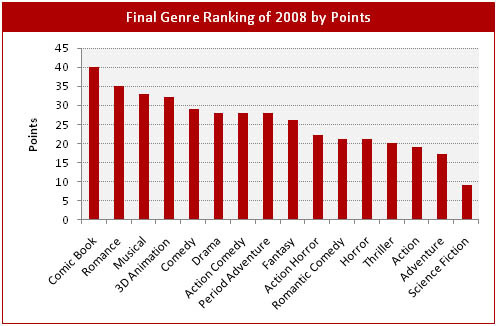 Science Fiction was the total looser in 2008. On the other hand, only one movie in the Top 100 can be truly added to this one, THE DAY THE EARTH STOOD STILL. Although Comedies made the most money you can see that Comic Book Adaptions (thanks to DARK KNIGHT) made by far the highest average gross ($327 Million) while Comedies with its high numbers of movies only made $58 Million in average. 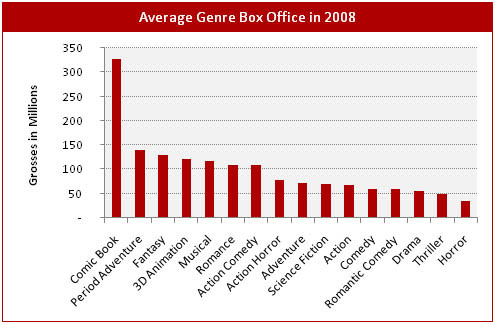 Period Adventure Genre has a high average gross but as we remember, INDIANA JONES is mostly the reason for this result. Again, without this movie, the genre only would have made an average of $80 Million. Surprisingly, 3D Animation is not listed in the Top 3. If you love this genre and hate this result, send your thanks to CLONE WARS and SPACE CHIMPS. Although Horror Movies are not the last movies in terms of total grosses they made in fact the lowest average amount of money (~$35 Million). 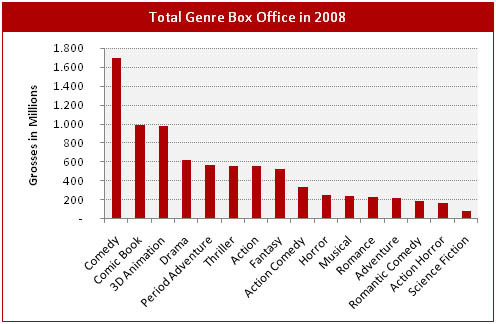 Those numbers show that Horror Movies were a niche market in 2008. My first reaction to the results? I so hope nobody important in Hollywood reads this blog. Seriously, in terms of ratios nothing beats the Musical Genre. The two movies listed as Musicals made in average more than five times the money they cost. Overall, the year 2008 was quite good for Hollywood since most genres (or better: their movies) made roundabout two times money they cost. Comic Book Movies like DARK KNIGHT might be successful, but in 2008 they also were pricey. The “ratio losers” of 2008 are the last four Genres in the chart. All of them made less money than they cost. Although Fantasy only looses by 1 percent, but it looses. Surprisingly, Period Adventure is one of the looser because of the disastrous performance of AUSTRIALIA. Another surprise is again the Horror Genre: Although it is the smallest in terms of average grosses, the production costs were so low that even with the low grosses they made quite respectable ratios. Now, while all three charts have valuable information they also create a new problem. Of course, all of them are valid and give a great statistical insight. So, in other words, regarding which statistical way you like more, you have three different genres to choose. And that is the exact problem. So, to resolve this last problem I decided to aggregate all three results into one final chart by counting points from 16 to 1 for their respective positions in each chart (first place = 16 points, second place = 15 points and so on). 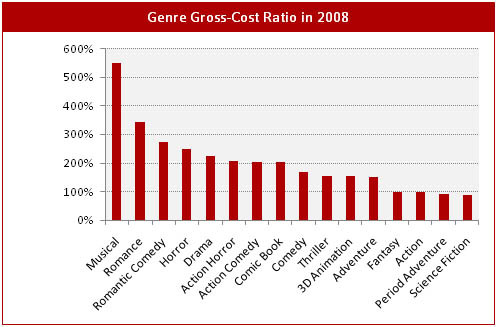 This way we can see which genre was the overall most successful in terms of total gross, average gross and gross-cost ratio. Did you spot any big surprises? I enjoyed the analysis. It would be interesting to compare it across years. I am interested to see where sci fi will fall for 2009 with the pending release of the new Star Trek film. that is a great idea! Thanks a lot for posting it. Currently I don’t have much time on my hands, but I promise I will do it. You are not the only one regarding sci fi. I expect this year to be very similar to last one because as far as I know Star Trek is the only true sci fi movie to be released this year (correct me, if I am wrong). Since J.J is involved in this project it could be a smash hit and push the genre as a whole closer to the top. Or at least away from the bottom. I was wondering if you performed analysis using a combined International and Domestic number or an International analysis…. Wow Romance really hung in there. Drama performed better than expected too. Of course name talent has a lot to do with box office revenue and factors significantly into your final genre ranking–the average indie romance or drama doesn’t do so hot. I’m encouraged to take a musical approach to an indie film now–attach an indie band and make a movie not entirely unlike a musical. Name talent might sometimes be one of the biggest influences – at least in terms of mainstream movies. but I also think the ‘problem’ might be almost insignificant for indie movies. Of course this is also some kind of circle of death to name it drastically. Without somehow well known names the average Joe isn’t interested in the least but bigger names cost bigger money. But I think that’s the charm of indie movies. Judging by the numbers an indie musical sounds pretty ‘safe’ because it looks like a safe investment. The only problem I see here is that a movie created by numbers might be a flop in the end. If you have an awesome and creative plot added with a cool as hell cast and some incredible music it might end up as a cult classic. In that regard I heavily recommend you Fooly Cooly, a short anime series from the year 2000. It’s one of the best things I’ve ever seen and in my opinion should be shown in the Museum of Modern Art. It’s not a musical in the usual sense (heck, it’s a full blown wacky comedy with a depth). But music is always present and the images fit to the fantastic rock by The Pillows almost perfectly. And now that I think about it: go and do it!!!! Go all out and create one of the most absurd musical comedies ever and you’ll have found at least one guy who’ll love you to the end of times: me.